Edward Snowden and Daniel Ellsberg: Is the NSA leaker a traitor? Is Edward Snowden a Traitor? If he is, so was Daniel Ellsberg. 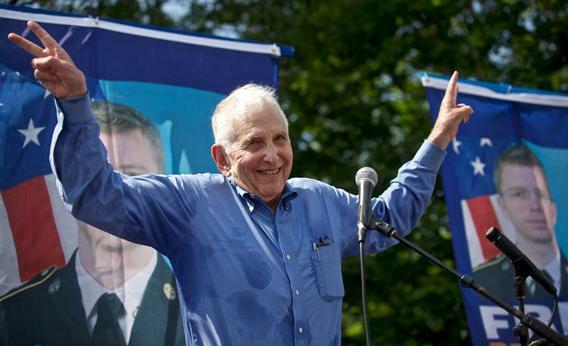 Daniel Ellsberg, who leaked the Pentagon Papers, speaks during a rally in support of Pfc. Bradley Manning on June 1, 2013, in Fort Meade, Md. The condemnations are raining down upon Edward Snowden, master leaker of National Security Agency surveillance programs. They come from the expected sources: House Speaker John Boehner calls him a “traitor.” But they also come from people you might expect to be more sympathetic toward him. Legal experts Geoffrey Stone of the University of Chicago and Jeffrey Toobin of the New Yorker both believe he betrayed his country and should go to prison. So does New York Times columnist David Brooks. A foundation of their argument is that Snowden is not a genuine whistle-blower. And it’s true that if you divulge classified information to expose the government and you don’t reveal a clear legal violation, you’re not, under current law, a whistle-blower. The federal Whistleblower Protection Act, passed in 1989, was written to shield government employees who reveal fraud and other wrongdoing. But it is riddled with exceptions. If you work for the NSA or the CIA, you’re out of luck—no protection for you. Snowden misses on both counts: He seems to have exposed no actual crimes, and he worked for the NSA. They may make movies about private-sector whistle-blowers such Erin Brockovich (fought toxic dumping) and Jeffrey Wigand (exposed tobacco company lies). But they prosecute government whistle-blowers such as Thomas Drake, who exposed waste and bureaucratic mess at the NSA, and of course Bradley Manning, on trial for the enormous WikiLeaks data dump. The Obama administration is moving to charge Snowden with disclosing classified information, probably under the Espionage Act—the anti-sedition law from 1917 that has recently become the government’s favorite weapon. The government can count on this much: Once Snowden is charged with crimes that will surely carry a long prison sentence, it will be harder to see him as a hero. That has certainly been true for Manning. I understand that some government secrets must stay secret. And I recognize that the decision of one employee to reveal what many of his superiors have ruled classified is inherently troublesome for people in power. And I also know that whistle-blowers are rarely pure and innocent and lovable. They are often paranoid and obsessive. They fill up your inbox with confusing and demanding messages. They ask you to hack through thickets of confusing material. In other words, they are time-consuming zealots who are often trying to confront you with knowledge you wish wasn’t true. But here’s my question for Snowden’s denouncers: What about Daniel Ellsberg? It’s only in retrospect that the leaker of the Pentagon Papers has acquired the status of a national icon. At the time he leaked the documents in 1969, Ellsberg was a man with top security clearance who was accused of betraying his government by exposing its greatest secrets. About an actual, troops-on-the-ground war. The Pentagon Papers showed that the Johnson administration knew that casualty figures in Vietnam would be much higher than the numbers it had publicly projected. * Also, that the Johnson administration had lied about the war to Congress. Looking back 40 years, we treat harsh criticism of the Vietnam War as patriotic and foresighted. But Ellsberg must have sounded like any draft-dodger when he decided, as he wrote in his memoir, that the war was “mass murder.” And he took it upon himself not to protest through any proper channels, but to go through the press. (Update, June 13: Ellsberg first took the Pentagon Papers to some senators and asked them to put it into the congressional record. He went to the press after they refused.) When Arthur Ochs Sulzberger, the publisher of the New York Times at the time, died last year, his obituary in his own newspaper called publishing the Pentagon Papers excerpts “a defining moment for him and, in the view of many journalists and historians, his finest.” But at the time, as Anthony Lewis pointed out, “it was not an easy decision for the Times” to publish. No wonder, then, that Ellsberg too was prosecuted for breaking the law under the Espionage Act. “I expected to go to prison for life,” he told NPR in 2011. The charges against him were dropped only because the Nixon administration egregiously violated his rights by breaking into his psychiatrist’s office to look for information that would embarrass him. “The bizarre events have incurably infected the prosecution of this case,” the judge wrote. If Nixon’s men hadn’t gone so completely off the reservation, how would we think about Ellsberg today? And how does his whistle-blowing stand up to the test posed by Toobin, Stone, and Brooks? Ellsberg and Snowden both acted unilaterally. They both ignored the collective judgment of the country’s duly elected representatives. I suppose you could argue that Ellsberg was exposing illegalities, if the Pentagon Papers showed Johnson administration officials lying to Congress. But if that’s the main test for being a whistle-blower, Snowden’s revelations seem to catch Director of National Intelligence James Clapper in misleading testimony, too. I realize we can’t have rogue operators undermining the government at every turn. But I keep coming back to this question: How do we make room for the secret-tellers who only history can show were on the right side?